Participating in music ensembles at Gustavus Adolphus College involves much more than simply making music – it can have life-changing effects. Ensembles at Gustavus are often described by students as families that form a special bond and grow together in pursuit of producing magical sounds for others to enjoy. The 68-member Gustavus Adolphus College Wind Orchestra, conducted by Dr. Douglas Nimmo, recently returned from a 16-day, five-country Eastern European concert tour from Jan. 22 to Feb. 7. After an intense few weeks of classes, rehearsals, and private practice, the ensemble embarked on a life-changing journey to Eastern Europe. The group performed a total of seven concerts in the Czech Republic, Poland, Hungary, and Austria, each with unique opportunities to connect with the local people. One such connection was formed through a prayer service for the people of Ukraine after the ensemble’s concert in Kety, Poland. 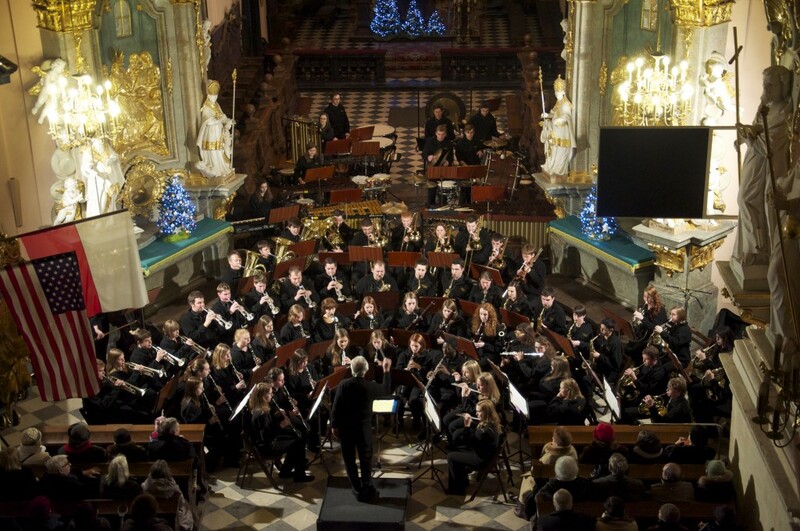 The GWO performing at The Church of the Holy Sepulchre in Miechow, Poland. One of the highlights of the tour for many of the orchestra members was a three-day homestay experience with families associated with the local music school in Pomaz, Hungary. There was some apprehension among students due to the language barrier, however the homestay turned out to be one of the most enlightening experiences of the trip for many ensemble members. “My host family was very sweet and didn’t speak much English, but that was the most fun part because I’ve never been in that situation before and I felt I learned a lot by living with them,” sophomore percussionist Nicole McKinney ’16 said. At the end of the homestay experience, the ensemble members came away with new friends and “honorary” family members. Other highlights for members of the ensemble included the unforgettable experience of visiting the Auschwitz concentration camp and the opportunity to explore the local towns and learn about the culture during down time. 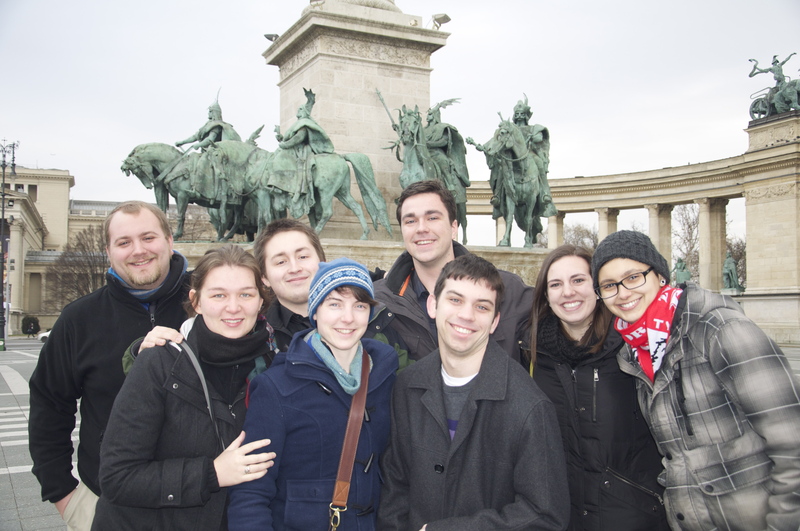 GWO members at Heroes’ Square in Budapest, Hungary. “After returning from this trip, I have a renewed sense of confidence and ability to adapt to adverse situations. This trip really let me explore not only what it meant for me to be in Europe, but also, on the larger scale, what it meant to be an American student in a foreign land,” Mason said. The concert tour was an exciting chance for the Wind Orchestra to exhibit its musical skills abroad, but many members also found that their experiences in Europe relate directly to their college experiences back home at Gustavus. “Throughout our tour, I noticed how the orchestra truly became a family. After rehearsing and touring together for five weeks, our relationships grew significantly stronger as did our collective relationship to the music,” Stevens said. “The shared experience of this tour will forever bind us together, and the art of music is what made that possible. I feel so grateful and blessed for this once in a lifetime experience and for the friendships I’ve made within my Gustavus Wind Orchestra family,” Stevens said. 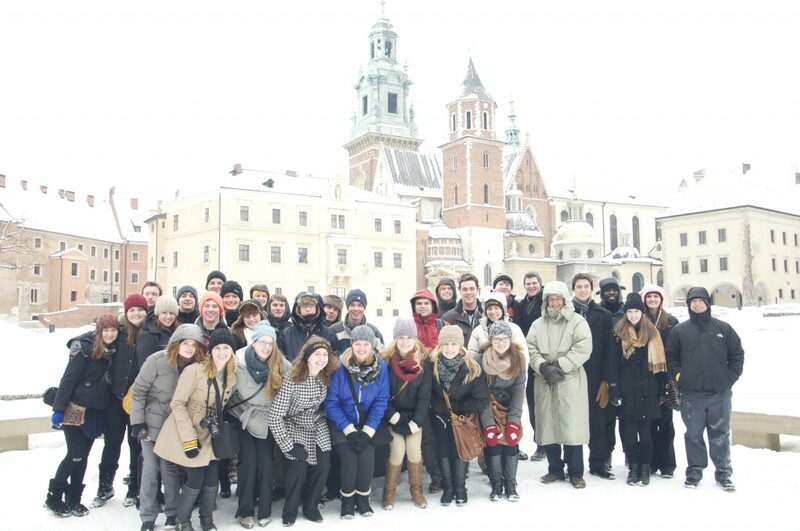 GWO members at Wawel Castle in Krakow, Poland. Following their return home, the Gustavus Wind Orchestra presented its home concert on Saturday Feb. 15 in Christ Chape. The 2014 Eastern European tour marked Nimmo’s last concert tour as conductor of the Gustavus Wind Orchestra, a position he has held since 1987, as he will be retiring at the end of the 2013-2014 academic year.